The Chairman of MIO-ECSDE Prof. Michael Scoullos goes to Gafsa, Tunisia, in support of an EU funded project dedicated to the historical Gafsa oasis (certified by the FAO in 2011 as a Globally Important Agricultural Heritage System-GIAHS). A MIO-ECSDE member organization, the Association for the Protection of the Medina of Gafsa, in its long standing efforts to preserve the oasis for current and future generations, is through this project promoting income-generating activities for the promotion of its products and by-products by women and youth groups. 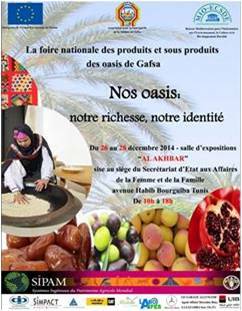 A very successful national festival took place in Tunis last December (see a short film in Arabic). The goal is to halt the loss of biodiversity and the ‘shrinking’ of the oasis, enhance the local economy, increase awareness and support the local community by involving them in the sustainable development of their oasis. The role of MIO-ECSDE is to overview the progress of the project and provide technical assistance.